Where To See Polar Bears In Canada? 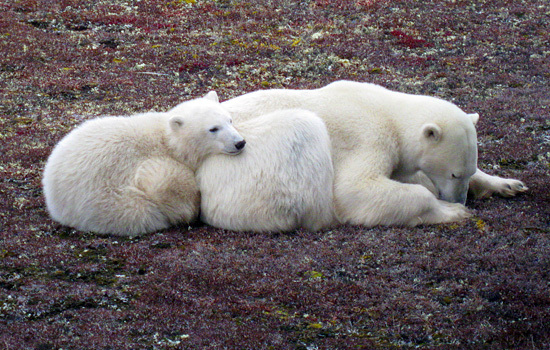 It's no secret that many polar bear populations are disappearing. Changes in the world's climate have destroyed much of the sea ice these creatures call home, making it harder for them to find food. The World Wildlife Federation and Earth Hour recently released a report that said these beasts could become extinct in their natural habitats by the end of the century. "The thinning and earlier break-up of sea ice in the Arctic is believed to be reducing the body weights of female polar bears and by 2012 the average body weight may be too low for them to reproduce," the report stated. There are 19 recognized subpopulations of polar bears throughout the world. 5 of these subpopulations are declining, and 7 more may be facing the same problem (though there is currently not enough data to determine their status). Despite these alarming trends, there are still a few places where the world's largest land predators can be seen in great numbers. In certain parts of Canada, scientists believe that the amount of bears might actually be increasing. The town of Churchill, Manitoba is often referred to as the "polar bear capitol of the world." As Canada's polar bears migrate from the inland to the shores of Hudson Bay, many of them converge in Churchill. It is estimated that 1,200 or more of these creatures move through the area each autumn. The window period to see these bears is very brief, lasting from October to early November. As soon as sturdy ice forms on Hudson Bay, they leave the area to hunt seals for the winter. The short migration period of the polar bears, and the potential for their eventual extinction, makes it very important to book your trip to Churchill as soon as possible. There are plenty of other wild and rare creatures to see while in Churchill. The town and its surrounding areas have a fair-sized population of arctic foxes. These small, white creatures, much like the polar bear, are disappearing in certain locations around the globe. Beluga whales (another endangered species) migrate to the Churchill River each spring. Need more information on Best Places To See Polar Bears In Canada? Talk to one of our Canadian travel Insiders who'd be happy to answer all your questions.